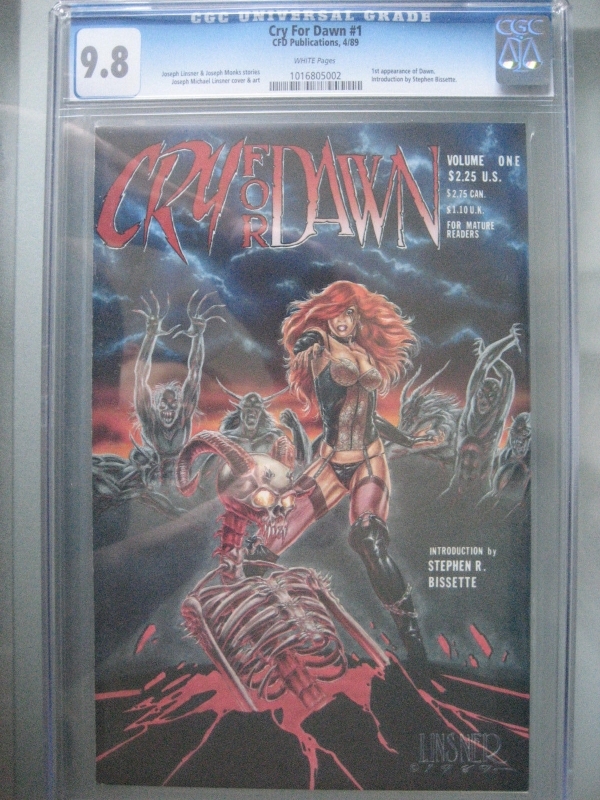 Cry for Dawn was a 9-issue horror anthology comic book. The book was primarily written by Joseph Michael Linsner and Joseph Monks with artwork by Joseph Michael Linsner. The series featured guest artist and writers in some issues, but the work was largely performed by Linsner and Monks. It was published by Cry for Dawn Productions from 1989–1992 and is famous for introducing the character of Dawn, the goddess of birth and rebirth. Although Dawn served as an emcee in the Cry for Dawn issues, she would later have many titles dedicated to her journeys through heaven and hell across multiple spin-off titles for Sirius Entertainment, Image Comics, and Linsner.com. Cry for Dawn was a mature-readers-only title that hit during the peak of the 90's independent comic rise. Due to the artwork by Linsner and the cutting-edge subject matter that the series dealt with, the titled developed a cult following that has continued in the decades following the publication. Please Be Sure To Check Out My Ebay Store! Free Priority Shipping with Delivery Confirmation! CGC Comics will be shipped padded in Priority Box or similar. International shipping will vary. Payment is expected within 5 days. Thanks for peeking!